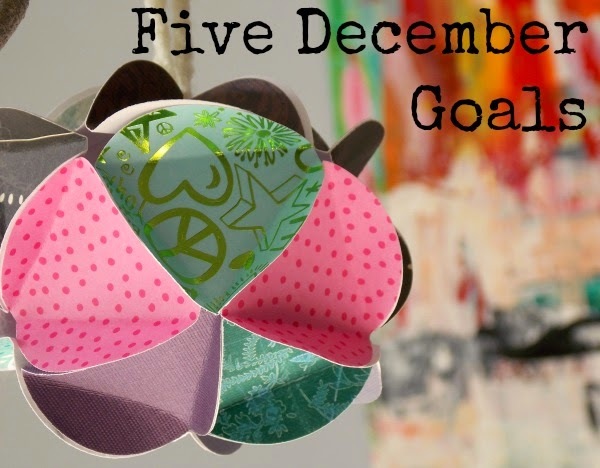 Here we are at almost the end of December and I never posted my goals for the month! These last few months have gotten away from me here in Blogland, but I'm hoping to reboot next week. 1. Read two new books. Done and done. 2. Write every weekday (besides Thanksgiving break). Done! November always inspires me to write, knowing that there are novelists writing thousands of words during NaNoWriMo (National Novel Writing Month). 3. Finish cleaning out the garage so I can fit my car in. Nope, didn't happen. *Hangs head* I still need to do that. 4. Write a letter. Done! I wrote a letter to one of my new favorite authors. 5. Get a new haircut. Done! Although I could really use another right about now. 1. Do something crafty. I made ornaments like the one in the photo above and it was super fun! I could do that all day. 2. Throw a Christmas party. Done! Though planning and preparing for parties is not my strong point, I really enjoy it once the party begins. 3. See the last Hobbit movie. Done! I got to watch it with a whole row of friends, so fun and a little sad that it's the last one, sniff. 4. Find or invent creative wrapping paper. I found the cutest wrapping paper with characters made to color in ~ the best of both worlds. 5. Enjoy time with family. Done and continuing! Savoring this Christmas break. I really enjoyed writing goals down every month this year. It helped me accomplish some tasks I was avoiding and also some fun that I might not have taken the time for. Thanks for cheering me on and even joining in! You inspire me to make lists and check things off too!!! Merry Christmas to you and your beautiful family Catherine! Should you ever come to Wichita again, let's get together.